I was so excited to be able to cut into my stack of Constellations by Lizzy House this weekend. It's been waiting patiently on the work table. Pressed and everything! My notebook filled up with so many ideas that I had a hard time narrowing it down to one. My son got a telescope for Christmas and we've been reading and talking about the stars and moon phases a lot. So of course I thought of stars. I kept the blocks big and graphic to really show off the fabric. Each star measures 12". The reversed layout also plays up the contrast of the stars. I LOVE this line so much. Especially the constellation prints. The working title for this quilt is "Stargazer". Luckily, I got to spend the afternoon sewing with my guild. All my fat quarters were cut up and the star points were made, but I ran out of time to assemble the blocks. I've been working on it a little here and there and it's starting to come together. Yay! 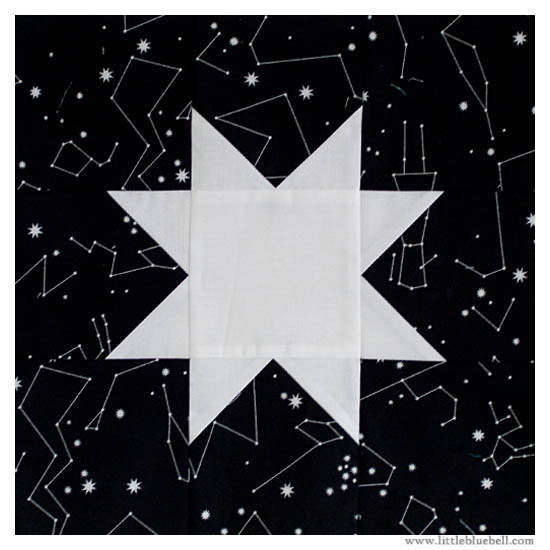 I really like the constellation fabrics with the white star...beautiful idea! I love how the constellations fabric (er, the ones with actual constellations) are cut up, it doesn't look cut up, it just makes new constellations! THIS is awesome. I've been eying the constellations fabric and wondering what I'd make with it...this is the perfect thing! What a perfect and fun design for that fabric! This is great! I'm making a blue and grey Ohio Star quilt for my master bedroom, and I'm backing it in the light blue Star Charts print. I love your reverse stars! Wow! It's so simple, but such perfect use of that fabric!! Love it. oh this is looking really cool! Love love love this! How much fabric are you using for this? Fqs or 1/2 yards? I think I may need to make something similar for my big boy :) because 6 quilts is not enough! How beautiful this is going to be! 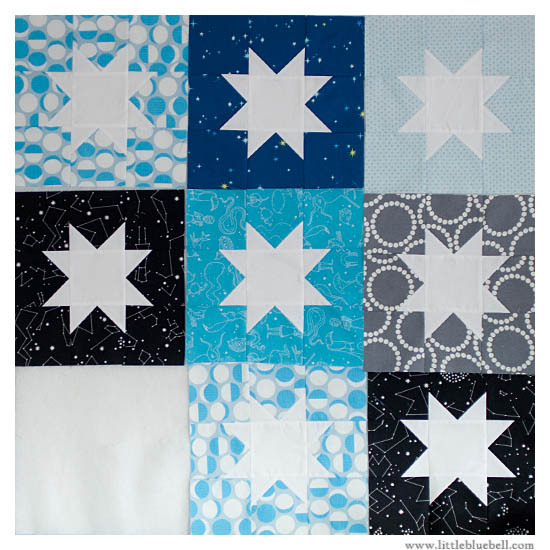 I love the constellation fabric idea with the star block! Can't wait to see it finished! Beautiful!... can't wait to cut into my stack!, very inspiring.